Samantha Ronson is coming to her woman's defense and telling PETA to back off. "I'm pissed at the bag of flour thrown on Lindsay last night" railed Samantha Ronson on her blog today. 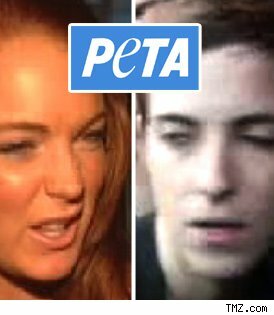 She added that the woman who doused Lindsay not only "acted liked an animal herself" but that it was actually an "insult to animals to group her in with them." Sam also calls PETA's previous apologies too little too late, and insists they should actually thank celebrities who wear fur since they are one of the only things keeping the agency relevant. Sam doesn't mince words when it comes to her lil' LiLo!